Caught on camera, Nigeria police stormed the meeting venue of Indigenous People Of Biafra (IPOB) in Ahoda west, Rivers state on Sunday, July 31, 2017 and began to shoot sporadically at Biafrans. 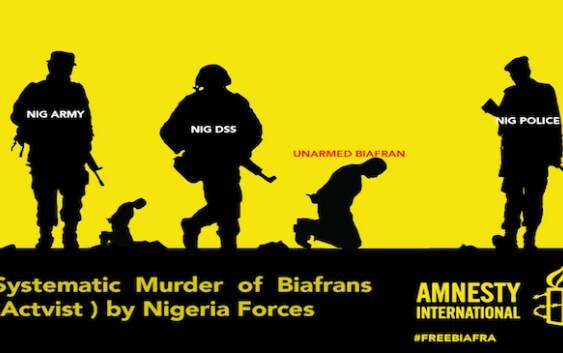 An eyewitness report obtained by Biafra Times stated that as people ran for their safety, the Nigeria combined forces of the military and police began to destroy their properties and anything they can lay their hands on. Some of their members were abducted and taken to state CID Rivers state. Watch amateur video recording here. The world should see what we are talking about.... Look how the zoo police are oppressing unarmed people of Biafra. United Nations is time to say/do something because keeping mute explains your involvement in the oppression of Biafrans by the government of the zoo called Nigeria. Soon we gonna revolt against the zoo government concerning this useless oppression. Naked and Raw Truth. UN. Show seriousness in your duties to humanity. Stop playing dangerous games for the peace of the world. The Great Biafran people have the right to split from deplorable and fantastically corrupt criminals in the Zoo called Nigeria. Nigeria as a nation has expired based on amalgamation agreement. UN and British should stop this unholy and dangerous behavior against humanity. FROM THE BIAFRAN RABBI.FELLOW BIAFRANS AND INNER-ZIONISTS,TAKE HEART OH BIAFRANS AS THE VICTORY IS NEARBY.FIRST,THE TERRORIST ZOO LEADER,MBUHARI DIED MAY19,2017 AND INSTEAD THE TERRORISTS HAUSA-FULANI SUPPORTED BY ALLY THE YORUBAS EACH GAVE NDIGBO QUIT NOTICES(YOUTHS ORGAN)TO COVER UP THE DEATH OF BOKOHARAM LEADER IN LONDON.NOW WE ARE WATCHING MORE TO THE EXISTING DEATHS OF UMU-IGBO IN THE HANDS OF THESE ENEMIES BUT A TIME IN HOURS AWAY FROM US SHALL THE ZIONISTS OF THE 21ST CENTURY DEMAND THE LIVES FROM THEM ALL (15MILLION)MUST BE SUBMITTED TO THE NEW WORLD ORDER.THIS IS THE NUMBER 3.5MILLION IGBOS BETWEEN 1967-2017 WOULD HAVE BEEN.TRUELY TRUELY I SAY UNTO YOU ALL,THE BIAFRANS WE MUST MUST MUST PURSUE,OVERTAKE AND RECORVER OUR STOLEN BIAFRALANDS WITH 15MILLION SOULS OF THESE ENEMIES IN THE NEXT TRIANGULAR FIRE AHEAD. AGAIN,BOKOHARAM HARAM LEADER,MBUHARI IS DEAD AND DEATHS AWAITS THE ZOO ARMY,POLICE,DSS AND ALL SUPPORTERS OF APC-MBUHARI-ONE ZOO NIGERIA. THIS IS JUST THE ZION GAME FROM THE INNER CIRCLE. URS THE BIAFRAN RABBI.